A 12-year-old Afghan girl and her mother lose their jobs when the Taliban closes the hospital where they work. The Taliban have also forbidden women to leave their houses without a ''legal companion''. With her husband and brother dead there is no one left to support the family, and without being able to leave the house the mother is left with nowhere to turn. Feeling she has no other choice, she disguises her daughter as a boy. Now called Osama, the girl embarks on a terrifying and confusing journey as she tries to keep the Taliban from finding out her true identity. 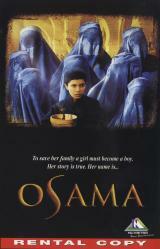 Inspired by a true story, ''Osama'' is the first entirely Afghan film shot since the rise and fall of the Taliban.